Scope: New ten unit housing development, on an empty site in the South End of Boston. The attached walk-up building mirrors the pattern of historic row houses that currently exist in the neighborhood. The building contains four apartments on the first floor and two apartments on each upper floor. 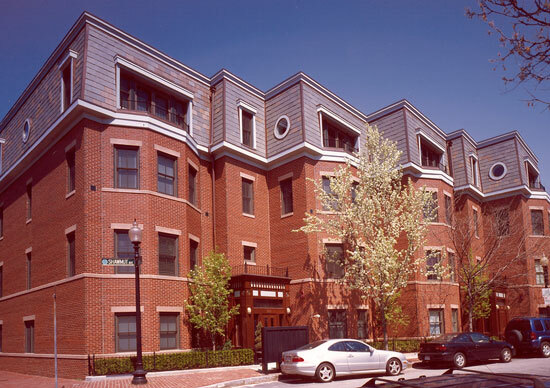 “Domenech Hicks & Krockmalnic selected us to build high-end condominiums in the South End of Boston. They were both architect and developer, and chose us because we’d done quality work for them before. A key objective for Peter’s Park was to fit into a neighborhood of historic walkup brownstones which line the streets in the South End. This was achieved with a four story wood frame structure with brick veneer, slate mansards along with detailed mahogany entrances. Our initial challenge was to drive wood piles and install grade beams in very close proximity to neighboring properties and the existing brick sidewalks of the corner lot. The units and common areas were finished with custom products and lighting which really made a statement about the quality. Spiral staircases were installed to large roof decks which boast exceptional views of Boston.